As football fever reached its peak with the FIFA World Cup — the world’s most watched sporting event2 — viewers were spoiled for choice with the number of mediums they could access. All thanks to Sony Pictures Network (SPN) and their omnichannel content delivery platform that spans both offline and digital. As part of our ongoing series on mobile growth, we chat with leaders at companies that are rewriting the rules of personalized mobile marketing and user engagement. For our customer spotlight today, we speak with Abhishek Joshi, Head of Marketing, Subscriptions & Content Licensing at SPN’s Digital Business who shares what it takes for a media business to succeed in today’s mobile-first world. Abhishek, tell us about your journey as India’s first OTT platform, and how you’ve managed to make such a mark in the OTT segment. As the first OTT platform in the country, SonyLIV set the tone for the VOD and digital media ecosystem in India. In our 5 year journey we’ve learned some key insights into the rise of video content, creating engaging mobile experiences, the power of choice for consumers, and using data science and machine learning through tools like CleverTap. 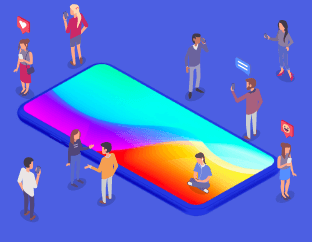 We’ve been able to better understand consumer personas and their consumption patterns to deliver user experiences that are unique to each viewer – personalized mobile marketing. With the digital landscape evolving, we’ve been able to evolve ourselves – providing a wide variety of content that caters to the needs of all our consumers in a number of languages. Can you share some of the marketing challenges that you experienced with such rapid user growth? As user acquisition took off, it became essential for us to not only ensure we could maintain that growth, but also maximize customer lifetime value. With increasing acquisition also comes the challenge of retaining those users. Having analytics and engagement within the same platform was essential to our retention strategy. In order to differentiate ourselves from competitors, it was important to get the user’s buy-in from the very beginning — from notification permissions to being able to access their location for localized content and geo targeting. This was essential for us to tailor the onboarding experience and also ensure repeat app launches. It isn’t enough to merely send push notifications or timely reminders to users based on their preferred content. With users getting multiple app notifications on their lock screens, it’s so important to go the extra mile and personalize messaging. In order to do that, we needed detailed user personas and insights into behavior and preferences — which was a challenge for us with the volume of users we were adding on a daily basis. Being a freemium OTT platform, it was essential for us to turn free users into paying customers. Which is why engagement through content was key. The challenge was building loyalty, and nurturing free users to subscribe to our services. With such a large user base, making sure that the right message reaches the right user segments at the right time is key. This requires personalization based on interests, with notifications using geo targeting so we can provide more localized content. With greater number of users come greater number of insights. How do you make sense of all that data and achieve personalization at scale? 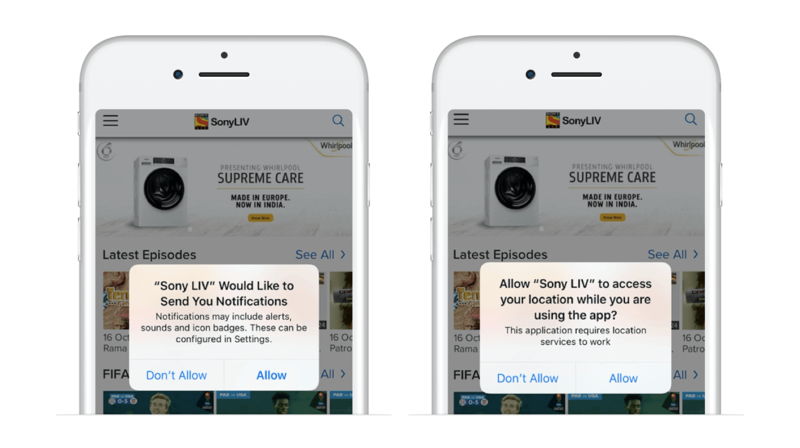 With the millions of active subscribers that we have on the SonyLIV platform, personalization can be a little tricky. We partnered with CleverTap to make sense of our user data. This allowed us to target our users with the right messages at the right time. 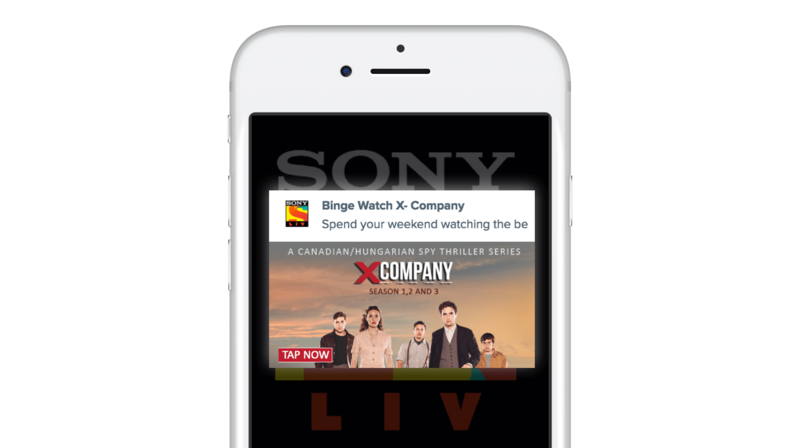 At SonyLIV, we encourage users to spend more time in the app by pitching new video content that matches each user’s viewing history. These related content notifications provide a customized user experience, such as content cross-sells. These in-app notifications encourage users to engage with new content without disrupting the user experience. For instance, if a user is watching the highlights of a Champions League soccer game, they might be prompted to view highlights for other matches from the same weekend. Based on user history, we are able to identify the content they are most likely to watch. This allows us to tailor push notifications using mobile deep linking, so that instead of simply launching the app and leaving users at the home screen, users can be guided to a specific screen within the app. 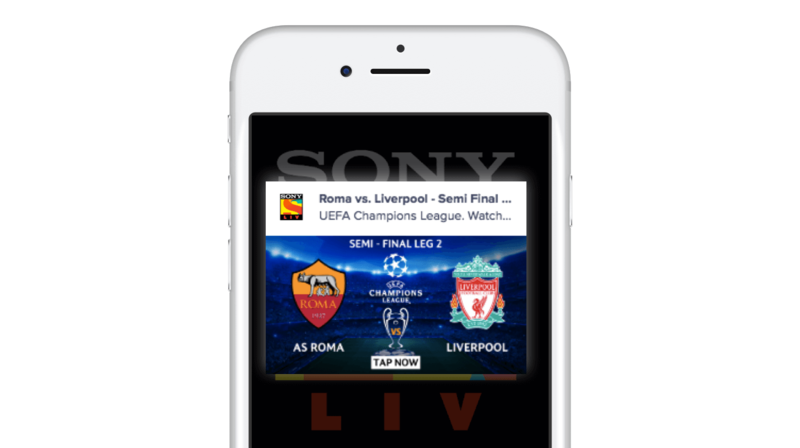 For one such campaign we targeted users who have a preference towards football and shared deep linked notifications for watching the Champions League semi-final between AS Roma and Liverpool. In absolute numbers, We drew in over 30,000 viewers with this one campaign. For OTT platforms that have a huge library of shows, users tend to watch multiple episodes in one go but also want to ensure continuity. For this we use RFM or Recency, Frequency, and Monetary analysis. This helps us personalize experiences for a binge watcher — who typically has a longer session duration than a regular viewer.For this type of user, engagement and frequency could be given more importance than recency. And this insight can be used along with mobile deep linking to maximize engagement. Just to give you an example, we put RFM analysis into practice during the launch of a Canadian-Hungarian spy thriller on our platform. This allowed us to send notifications to all viewers in the binge watcher category. This campaign was sent to over 11 Million users, and saw conversion rates of over 16%. What helped with the conversions was the fact that clicking on these notifications allowed them to continue watching right where they left off. With insights that we got from the CleverTap analytics tools, we were not only able to identify users and their locations, but also target them with localized content. We were also able to tailor the content of the notifications based on interests, adding elements such as emojis to ensure higher CTRs. 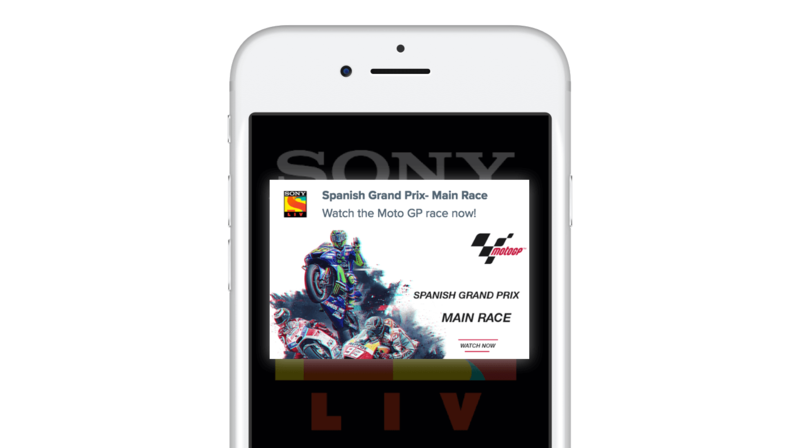 This helped us segment similar users to achieve much higher conversions — over 25% in the case of our geo-specific campaigns for Moto GP. The FIFA World Cup is one of the biggest sporting events in the world. You talked about personalizing at scale — with over 70 Million visitors using SonyLIV, what were some of the CleverTap features that you saw value in? As the official mobile and internet broadcaster for FIFA, SonyLIV was the go-to destination for all football lovers. As you rightly mentioned, we had over 70 Million viewers on our platform during this period. In order to ensure app stickiness, we monitored the behavior of all our app users to personalize their experiences. This is a CleverTap feature that allows us to segment users in real time, based on certain actions or inactions they may undertake within the app. For instance, by identifying users who are supporting a particular team and have logged off the app, we were able to send customized push notifications encouraging them to come back to view a match that their favorite team was playing. By seeing the different ways users viewed the matches, we could identify their preferences to craft user journeys that successfully keep them engaged and not only increase stickiness, but also conversions. Cohort Analysis was another analytics tool that helped us get a much better understanding of our users. We use it to track users based on their browsing/viewing history, consumption patterns, preferred genres, etc. on a daily, weekly, and monthly basis. During the FIFA World Cup, this enabled us to spot potential user drop-offs before they happen and create targeted user engagement campaigns to bring them back with fresh content based on behavioral trends. Would you like to tell our readers about some of SonyLIV’s new growth initiatives around the FIFA World Cup? Yes, Absolutely. The FIFA World Cup frenzy started for us with the launch of our #ScreamLoud campaign which captured the excitement of football fans across the country cheering for their favorite teams. This was received quite well, and came seventh in YouTube Ads Leaderboard comprising the top 10 most-watched ads related to the 2018 FIFA World Cup Russia3. The World Cup also saw the launch of a host of innovative video-on-demand (VOD) features like key moments, highlights, match playbacks, and real-time updates for a seamless viewer experience. We also brought viewers many industry firsts, such as the first ever social (Facebook) chatbot in the OTT entertainment space which updated users with match fixtures, points table, and helped set reminders for games. Which is why it’s no surprise that we managed to get over 70 million viewers on Sony Liv during the FIFA World Cup4 – a record for any tournament played outside India. And the surprising part was that while we saw high viewership from cities like Kolkata, Cochin, and Mumbai – which have a rich history with football; we saw high viewership coming from cities like Ahmedabad and Lucknow too. The OTT space has seen a number of entrants in the past couple of years, including a healthy mix of homegrown players and international heavyweights. How do you manage to keep your users’ attention and continue to grow your audience? Being an omnichannel platform, we have the advantage of being able to provide region-specific content. Our biggest chunk of viewership comes from our TV shows and Live sports streaming that we are the official partners for. SPN owns a large chunk of the official rights for major football, wrestling, and cricket events, which is why a sizeable number of users on the platform come for sporting events. And with more sports programming lined up, we don’t see the excitement dying down after the FIFA World Cup. SonyLIV recently extended its English content category and brought in for its viewers award winning series like Damages, Timeless, Underground and more. SonyLIV is also set to add more to this content pool as part of its SVOD offering. An area that we’ve been focusing on is the regional content, with more than 80 shows in over 5 different languages. 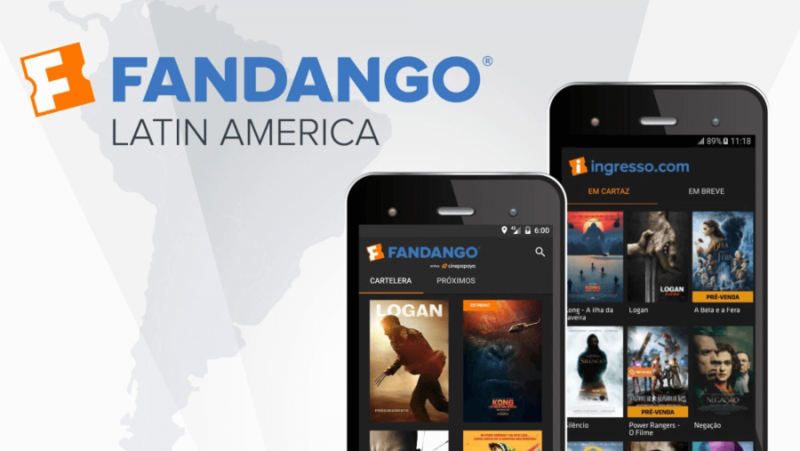 Regional markets are largely underserved when it comes to OTT content. With the localization capabilities both for content delivery and segmentation, we see a lot of growth coming from markets where regional content is consumed in languages like Marathi, Gujarati, Bengali, Tamil and Telugu. OTT content consumption on mobile devices is already redefining the concept of prime time, and we can expect to see an upsurge with the increasing number of mobile devices being sold everyday.